Saxon Shore forts are defensive fortifications, built by the late Roman Empire to defend the coast of the Roman province of Britannia (Britain) and the opposite side of the English Channel. During the 3rd century, the Roman Empire was weakened by the succession of brief emperors on the throne, internal fighting and invading tribes encroaching the Empires borders and frontiers. Britannia was no exception, with repeated Saxon and Frank pirates raiding the coastline. To counteract this Saxon threat, a great chain of forts called the Saxonicum (Saxon Shore) was commissioned to protect the Roman population and strategically important sites from the raiding parties. Whether this was actually their initial purpose is unknown, but the forts essentially became the new frontier in protecting Britannia’s eastern and SE shoreline till the collapse of the Empire and beyond. The Notitia Dignitatum, a document of the late Roman Empire details the administrative organisation of the Eastern and Western Empires. It is unique as one of very few surviving documents of Roman government and describes several thousand offices from the imperial court to provincial governments that includes nine Saxon shore forts built to defend Britannia’s coast. 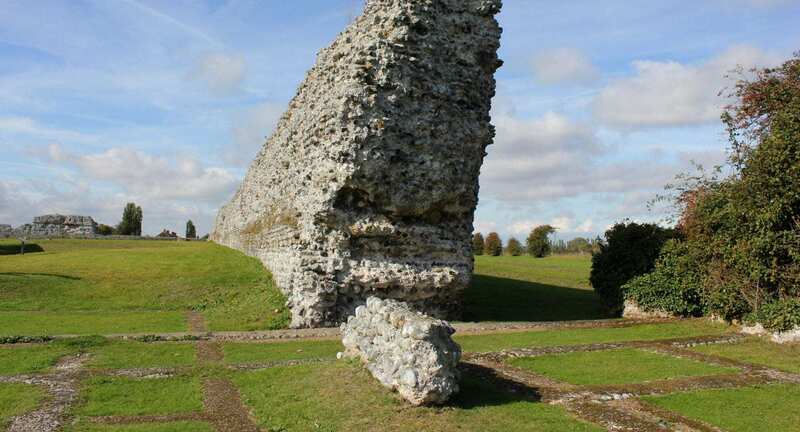 Rutupiae / Portus Ritupis or today known as Richborough Castle / Richborough Roman Fort is located near the town of Sandwich in Kent. The fort was founded after the Romans first arrived to Britannia on an island on the south side of the Wanstum Channel. 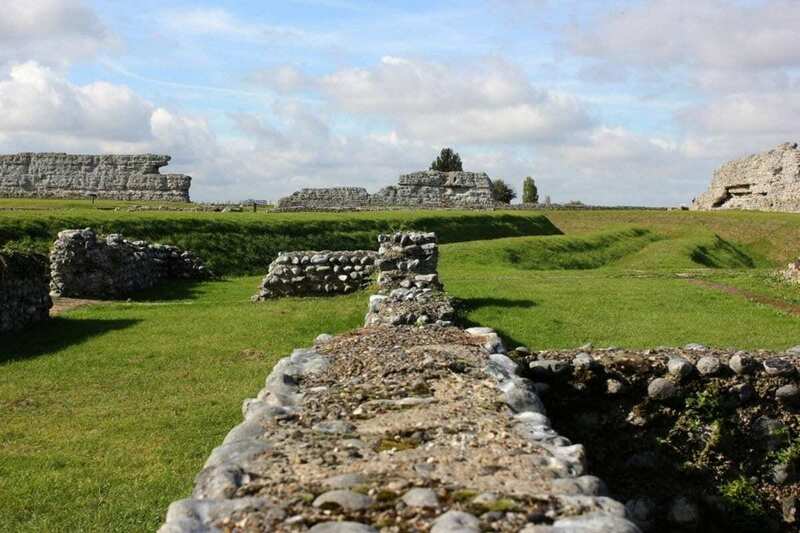 Many historians believe that the fort is the site of the Roman landing and later became the starting point for Watling Street, a famous Roman road which runs from the south-east coast, through Londinium (London) and onto Viroconium (Wroxeter) near Wales. Construction of the early fort begun around the 1st century and acted as an initial staging post. A large 25m high quadrifrons triumphal arch was later erected in the centre of the fort to signify formal entry into Britannia and to celebrate the final conquest of the new Roman province after Agricola’s victory at the Battle of Mons Graupius. 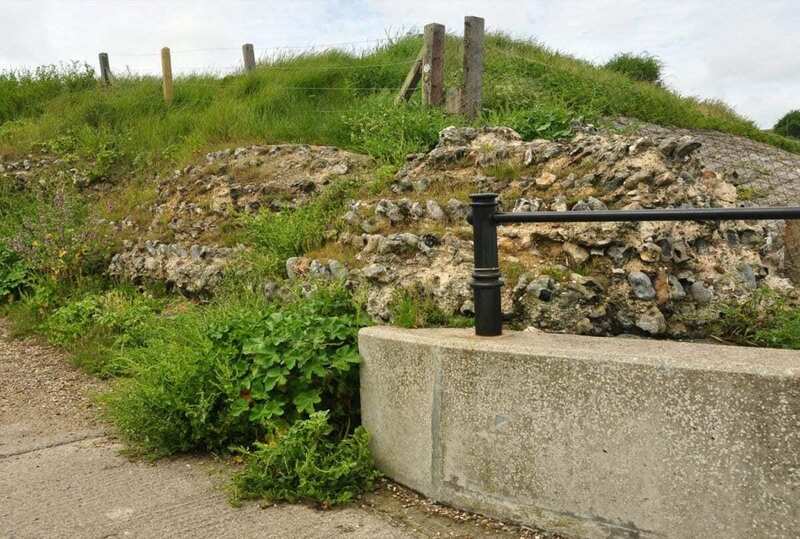 The original Roman fort was enlarged between 277 and 285 CE and subsequently converted into a Saxon shore fort due to its proximity to the coast. An area of 5 acres was surrounded by large stone walls with imposing ditches, circular corner towers and rectangular interval towers. The site was occupied into the 5th century and reused in Anglo-Saxon and Medieval times. 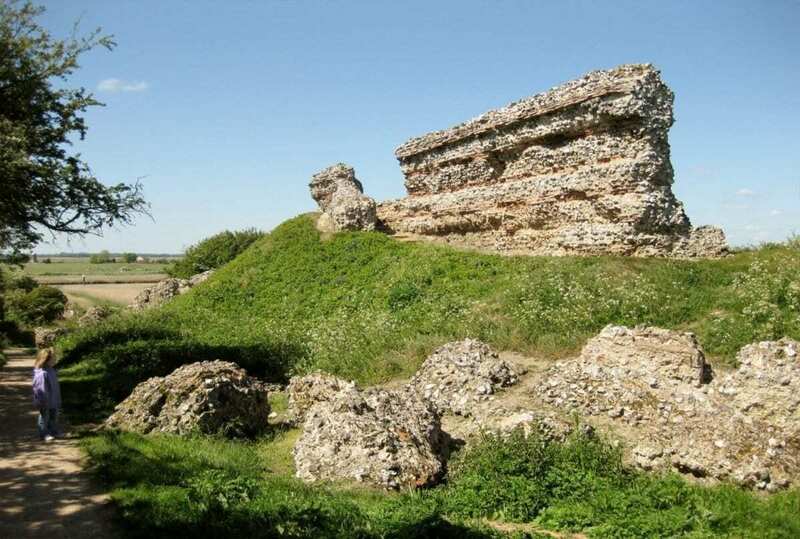 Branodunum was an ancient Roman shore-fort located near Brancaster in Norfork, built around the year 230 CE. The initial typical Roman fort served to defend a shoreline harbour during the Roman era and was garrisoned by the Equities Dalmatae Brandodunenses, although archaeological finds suggest that the Cohors I Aquitanorum was also stationed there. By 325 CE, a Saxon shore fort is constructed that utilises the alignment of the original fort, but the internal features and fortifications go through continual redefinition. Some of the forts walls survived well into the 17th century, but continual robbing of the stone has now left only earthworks as visible remains today. Burgh Castle was a Saxon shore fort constructed near modern Great Yarmouth in Norfolk around the late 3rd and 4th century CE. The fort is mentioned in the `Notitia Dignitatum’ as `Gariannonum’ and associates the Stablesian cavalry as being stationed there. The Roman fortifications remain some of the highest surviving Roman walls in Britain today, measuring to a height of around 4.6 metres tall. A Norman motte, utilising the Roman fort as a bailey formerly stood in the south-west corner of the site that dates from the 11th and 12th century. Othana was a Saxon shore fort located near the modern village of Bradwell-on-Sea in Essex around the 3rd century. According to the Notitia Dignitatum, Othona, the fort was garrisoned by a numerus fortensium (“numerus of the brave ones”). The fort was surrounded by a stone wall, 14 feet thick with an inner rampart and outer ditch but has since been undermined by the sea and much of the eastern remains of the fort have since been washed away. 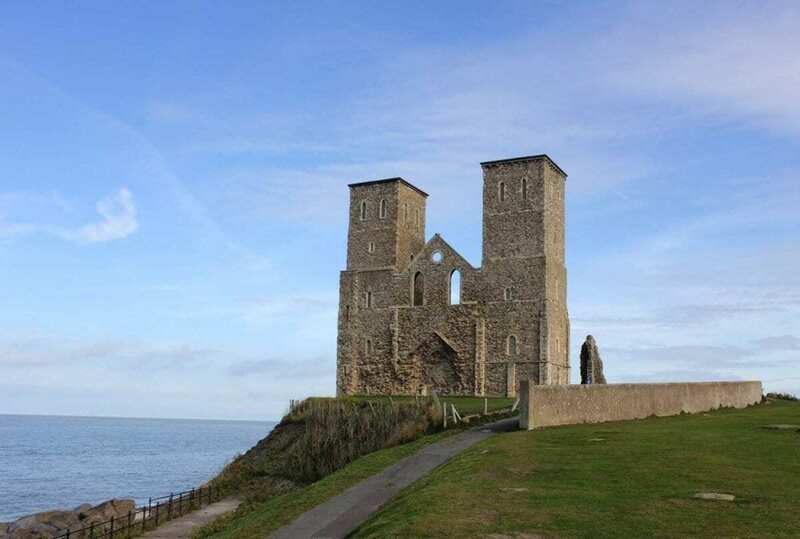 Regulbium was a Roman fort built adjacent to modern Reculver in Kent and means “great headland”. 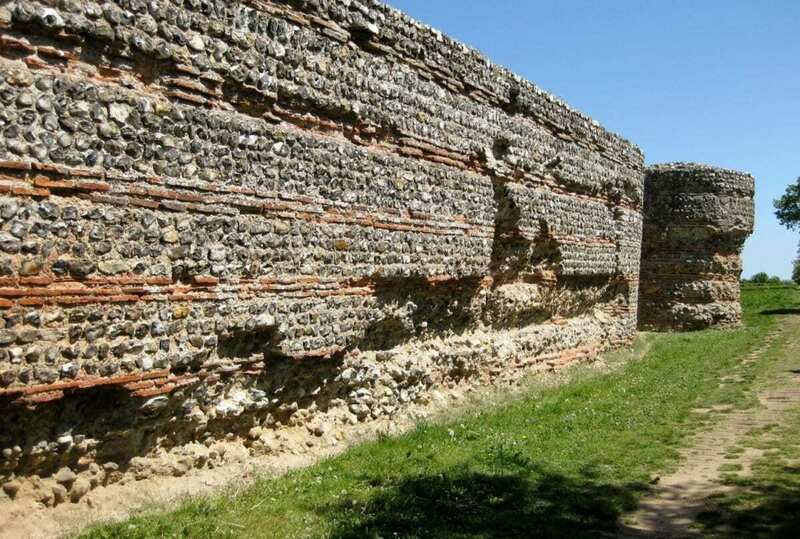 An early Roman fort was constructed in the area shortly after the Roman invasion and was connected to Durovernum (Canterbury) by Road. A later Saxon shore fort was built in the early 3rd century around 210 CE but by 360CE became relatively abandoned by the Roman military. The design of the fort at Reculver can be compared with those along Hadrian’s Wall, in northern England. The Notitia Dignitatum reports the garrison at Reculver as the Cohors I Baetasiorum, and this is reflected in the discovery there of tiles stamped with the initials “CIB”. The Cohors I Baetasiorum were previously stationed at Maryport, in Cumbria, and, since they probably built the fort at Reculver, this may explain the similarity between it and the forts along Hadrian’s Wall. After the Saxons settled in the former province, Regulbium was renamed Raculf and became a residence of the Kings of Kent and a Monastery was founded by King Ecgbert of Kent in 669CE. Dubris, also known as Portus Dubris and Dubrae, was a port in Roman Britain on the site of present-day Dover, Kent, England. Dubris was a major base on the British Coast for much of the second century CE, where the Romans constructed an early fort, harbour installations and two lighthouses, one of which remains in the grounds of Dover Castle. By the middle to latter part of the 3rd century, the Romans constructed a Saxon shore fort on the west bank of the Dour estuary, on ground overshadowed by high hills to the south-west under the modern town. Excavations of the fort have revealed walls 2.42 metres thick, built of tufa and chalk blocks, several external towers and bastions that suggests an unusual trapezoidal shaped outer wall. 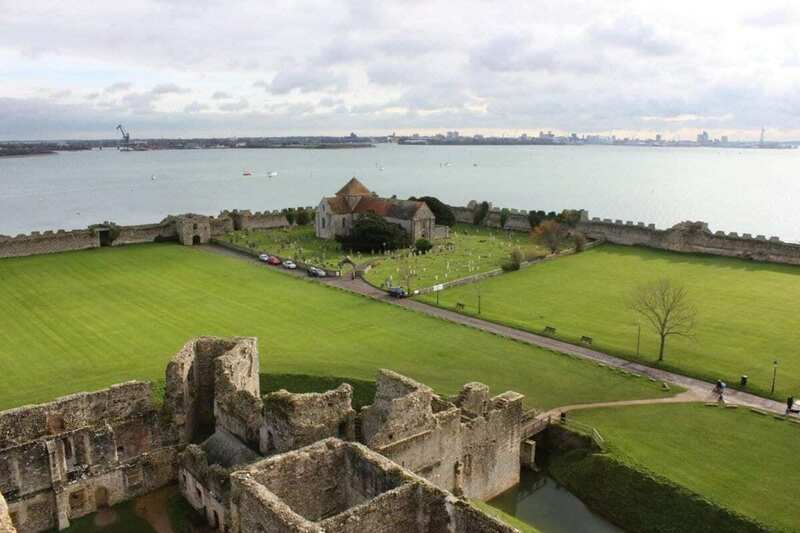 Dubris and Gesoriacum formed twin fleet bases guarding the channel straits, it has been suggested that Dubris was probably the seat of an officer of the Saxon Shore force. Portus Lemanis, also known as Lemanae, was a Saxon shore fort, settlement and port in southern Kent. The walls of the site are 3.5 metres thick with semi-circular bastions and form an irregular pentagonal plan. Many of the circuit walls have collapsed due to land slipping and this is suggestive as to cause the forts abandonment so quickly after construction around 370AD. Anderitum was a Saxon short fort built in East Sussex that was later converted into a medieval castle known as Pevensey Castle. The fort was built on what was then a peninsula of land rising above the coastal marshes. The fort’s construction has been dated to around 290CE, based on the dating of wooden piles which were found underpinning the Roman walls in an excavation carried out in 1994. Anderitum appears to have been a particularly important link in the Saxon shore forts as the Notitia Dignitatum mentions a fleet that was presumably based there, the Classis Anderidaensis. After the collapse of the Roman Empire, the local population appears to have moved into the abandoned fort, perhaps for protection against Saxon raiders, and its name continued to be used well into the Saxon period. 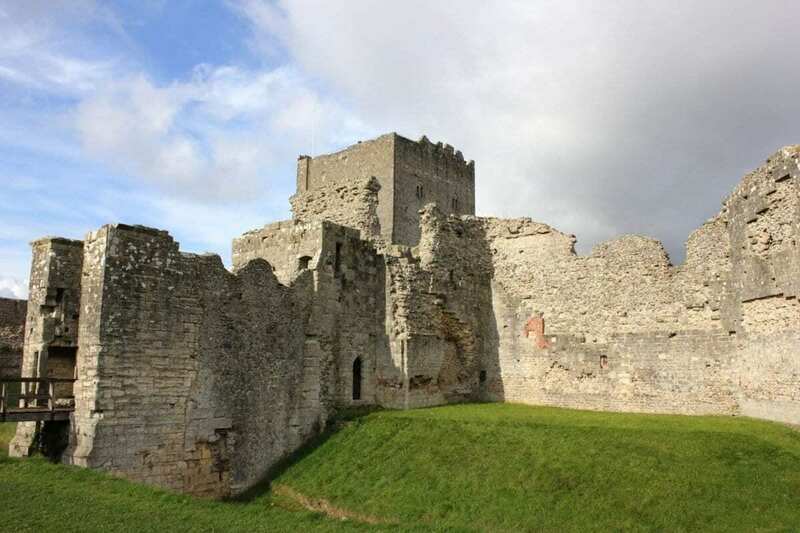 The fort was later used for shelter by William the Conquerors army after landing in Pevensey Bay, before being converted into a castle around 1100. 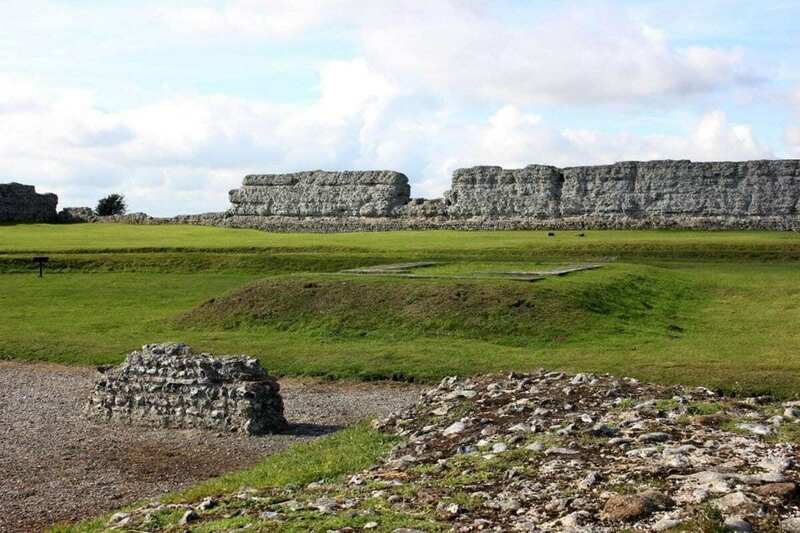 The fort was built during the 3rd century and encloses an area of 9 acres with outer walls 20 feet (6 m) high, 10 feet (3 m) thick, 210 yards (200 m) long and constructed of coursed flint bonded with limestone slabs. Unusually for a building of this period, most of the walls and bastions are complete which makes Portus Adurni one of the best preserved Roman forts north of the Alps. After the collapse of the Roman Empire, Portus Adurni became an Anglo-Saxon residence and later a Norman Castle and Medieval palace. The fort was occupied for almost sixteen centuries, with its last official military function being a gaol (prison) for captured French soldiers during the Napoleonic Wars.